This revised edition includes content from McGraw-Hill Construction, where the professionals stay informed on the latest industry developments. 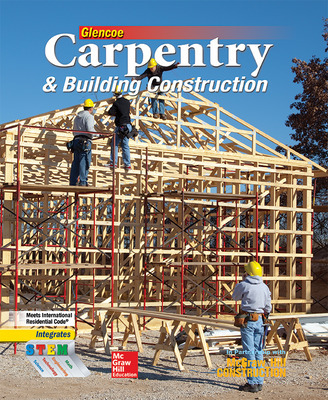 Carpentry and construction industry standards are fully integrated, and project-based learning is supported with unit-based projects that include technical math. Step-by-step illustrations, photos, and graphs guide students through each key process. This revised edition includes content from McGraw-Hill Construction, where the professionals stay informed on the latest industry developments. Carpentry and construction industry standards are fully integrated, and project-based learning is supported with unit-based projects that include technical math. Step-by-step illustrations, photos, and graphs guide students through each key process. Regional applications are studied in Regional Concerns features. Rigorous academic content is supported, especially in math and science, with STEM activities throughout. Estimating and Planning, Job Safety, Builder's Tip and Step-by-Step Applications features and activities help build technical knowledge while students practice the latest techniques, including Build It Green construction tips and activities. SkillsUSA and NAHB event prep activities are integrated.